Thank you to Noreen Bavister for permission to reproduce this article. I was brought up a Baptist and going to church every Sunday with my Mum and Nan was a family tradition. Afterwards we would go back to my grandparents' house and have a coffee and a biscuit with my Grandad and then head home to prepare the Sunday roast. When I look back I don't think I ever really understood what being a Christian meant. But I think I thought that by going to church I must be one. As I got older I began to find other things to do on a Sunday morning and then I left home for university. I didn't think for one moment that I should perhaps join a Christian group or find a church. After all, that was something I did with my Mum and my Nan when I was at home. In 1998, following University I moved to London, got my own flat and found a boyfriend. Still I showed no inclination of finding a local church. But then one day in May 2006 my world changed. My Dad, who had been ill for a few weeks was diagnosed with an untreatable form of lung cancer. The doctors said that the longest a person had lived with the illness was five years but it was an aggressive cancer and most sufferers died much earlier. God obviously knew that I would need Him for the times ahead and had already put a plan into action. At the beginning of that year a lady had joined the same team as me at work. Noreen was full of fun and had done much in the way of charity work but she was also a very committed Christian and a Catholic. It was the first time I had ever talked to a Catholic regarding their beliefs. Through my interest in her charity work she managed to talk to me more and more about God. She is a great example of how witnessing your faith to others is a real encouragement. It certainly sparked something within me as I began to feel a strong desire to find a local church and get to know God. I think this was due to a combination of reasons, my father’s illness, Noreen's intriguing stories of God's action in her life and also because I was single again (having split from my boyfriend the year before) and now had the time and space in my life to hear God calling. In June 20061 went on a short trip to Spain with a friend, unbeknown to me she was a Christian and was reading a book called the Purpose Driven Life. I asked if I could read it. I was hooked by the first page; questions I had about God were starting to be answered. I made a promise to myself that as soon as I got home I would find a church. I googled' and found that the nearest was called St Peter's Barge. It was as labelled a church on a barge in the middle of West India Quay in Canary Wharf, London. And in perfect timing I turned up the day before they were about to start a five week course on what it meant to be a Christian. I attended and by the end of it I knew I wanted to be a Christian. I was a Christian. And so that's how my journey began. I can see now how God's plans for me were starting to take shape. As part of this story I must tell you that my Mum had been studying the book, the Purpose Driven Life as part of her church group. I didn't know at the time. Imagine how shocked she was when she found it on my bookshelf and said 'I can't believe you're reading the book. Only a couple of weeks ago we finished studying it and we all had to pray for two people we would like the book to help and I prayed for you and your Dad. Well, God had answered my Mum's prayers for me and so I gave the book to my Dad (not a religious man but far from being an atheist). I was now fully committed to being a Christian and loved attending church on a Sunday. God was taking care of me and thankfully had me in hand when the next bombshell was about to drop. On 12th September 2006, 1 was woken by a knock on the door at midnight. Mum and Dad's best friends were on the doorstep with news that I least expected. At 10pm that evening my Mum had collapsed and died instantly, she was just getting ready for bed. We were later to learn that she had a massive brain haemorrhage. An aneurism in her brain, that she probably had from birth, had chosen that night to burst. I thank God with all my heart that at that point He had me firmly in his grip. Through my new found faith I was able to accept her death much easier than I would have been able to before. Always looking to be thankful for the life we had shared and the wonderful memories created. Of course it was also a devastating time, my Dad was still going through chemotherapy treatment. At the time we had all been concentrating on him, thinking he would go first but what did we know? As I look back now I see this was all part of God's perfect plan. My Dad decided that he would go to church in place of my Mum. As time progressed he became more and more involved, going to small church groups and even hosting a Christmas party at the house for them. I remember my Dad with great admiration. Not only was he suffering from a horrendous illness but he never wanted to get down and was determined to live as long as possible for the sake of my brother and I. And he did have a very full 19 months after my Mum's death before his time was up. His good friends had a huge part to play and are a testament to how important loving friends are in a time of suffering. Just two days before he died he asked the Vicar to come round and we held a very informal communion service for him. The first time he had ever taken communion. God was so good. Through my Mum's death my Dad had come closer to God. It gave me a great deal of peace when he finally passed away on 7th May 2008 with the Image of The Divine Mercy Jesus at the foot of his bed. Following my Mum's death, God was drawing me closer all the time and by some miracle he managed to get me to Medjugorje in November 2006. Of course I didn't know anything about the visionaries and messages from Our Lady. Coming from a Protestant faith it all sounded very strange to me. Noreen had somehow managed to get me there thinking that I was seeing a charity that we might be able to help, she also asked if I would like to join an organized pilgrimage lead by Father Prusakiewicz (by this time myself and a group of colleagues had joined with Noreen, to officially set up a charity called the Global Children's Foundation). When I met everyone else on the pilgrimage it was apparent that I was the youngest one by quite some margin and on the pilgrimage from the airport to my horror everyone started to chant the rosary. Remember I was a Christian, but not a Catholic. It sounded so strange to me and to be honest at this point I was actually scared about what the week would have in store for me. I even cried on the first night because I was so concerned about what was going on and why I was there. We had very basic accommodation, the weather was absolutely freezing and I was surrounded by very strong Catholics. I thought it would be a long week but by the grace of God by the end of it I had definitely changed, my conversion had begun. 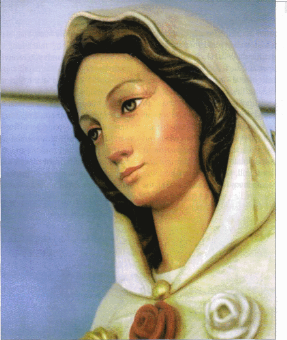 I opened my heart fully to Medjugorje, I believed everything about it. I was amazed that I had never heard about it before. On the third day I asked Noreen for rosary beads and she also gave me a booklet on how I should pray the rosary. We attended Mass every morning and each time I cried when the others went up to receive Holy Communion and I couldn't. I knew then that one day I would receive. Although I was anxious to receive how would I ever make that jump? Apart from Noreen and my new pilgrim friends I didn't know any other Catholics. I don't think anyone in my family had ever been a Catholic, it seemed like a massive jump to make and besides there were still too many questions I had about the faith, for example; why would you confess to a Priest? Why do you pray to Mary and the saints? Why are the services so prescriptive? Thankfully Father Peter Prusakiewicz (CSMA) was leading the pilgrimage and he patiently answered many of my questions and was to help me on my journey over the next three years. I returned from Medjugorje feeling on top of the world. I told my Dad about the amazing people I had met, how each of them had suffered in some way but each loved and trusted God with a passion that I hadn't seen before. I hope that in some way I encouraged him to want to know God more. In my heart my conversion had begun. Our Lady had definitely had an impact on me. But of course the devil didn't like where I was going. After returning from Medjugorje on a high it didn't take long for him to get his claws in. He found my week spot and he led me a merry dance into mortal sin. It amazes me even now to think how it is possible to consider yourself a Christian, to know right from wrong and yet still be so easily tempted. I wouldn't say I didn't put up a fight, but when you get worn down by temptation at some point you stop fighting it and worse still, you justify it. And I was young in my faith I didn't have all the spiritual armour to protect myself. I felt like I was a rag doll in the jaws of a Rottweiler, mauled and shaken until I didn't really know who I had become. It took me many months to say enough is enough, but finally through God's grace, good friends and a lot of prayers I got through it. And I have come back much stronger because of it. 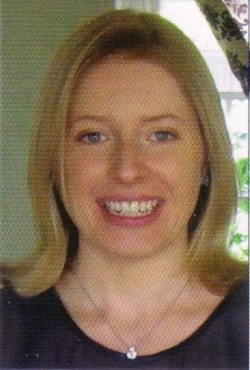 By May 2007 I had come out from the 'darkness'. I took my Dad on pilgrimage to Poland and again my call to conversion felt stronger. I still cried during the Mass. I felt like Jesus was saying, 'how much longer am I going to wait until you receive me (in the Eucharist)? What is stopping you?' We stayed at the Shrine of the Divine Mercy near Cracow and Sister Faustina was the first saint I had really heard about. I read her Diary with enthusiasm, eager to learn more. The Divine Mercy seemed so amazing that again I couldn't understand how I hadn't heard about it before. Surely, at least every Christian should know about it? Why was it not celebrated in every church on the first Sunday after Easter? Just a few weeks later I was lucky enough to go back to Medjugorje. How I love that place! Noreen and I joined the Mary's Meal's conference there and heard so many great stories of how they have helped children and families around the world. It really was mercy in action. I returned home refreshed and invigorated but going to my church was now becoming harder for me. I felt I had seen so much more. My eyes had been opened to the unseen spiritual world - the angels, the saints and the loving role of the Blessed Mother. Subjects so rarely talked about in the Protestant faith, or at least the churches I had gone to. It was a time where I did much questioning of both faiths, trying to understand where I fitted. Maybe I tried too hard, maybe I just needed to listen to my heart. Over the next two years I would attend the Polish pilgrimage twice more and go to the first Worldwide Divine Mercy Congress in Rome. I attended Divine Mercy services and talks on St Faustina and the angels given by Father Peter when he was in the UK. In May 2007, God had also brought my future husband into my life. Not a Catholic, or a Christian, but my soul mate. There are few men that would stay with a girl, who on their first date announced, "Jesus is the most important man in life". He has supported me in everything I have done, including my conversion (I'm pleased to say he still attends church with me every Sunday). We married in September 2008 and seven months later we moved out of London to a smaller town in Surrey and I made a promise to myself that I would find a Catholic church and give it a go. I didn't know that the closest one would celebrate Mass at 9am on a Sunday! Still, we persevered. Although after a few attempts I was almost ready to give up. I found it difficult to settle there, it didn't seem as welcoming as my old church had been. We didn't know the words to most of the service or when to sit or when to stand. I felt like an outsider. It's not easy being a convert. It was in fact my husband who encouraged me to stay and to try to talk to the Priest. Thank God I did. I learned that there was an RCIA course just starting and so I joined. I went along enthusiastically each week, eager to learn more about the faith. I can honestly say I loved everything I learned. At the Easter vigil this year I was finally accepted into the Catholic Church, baptised, confirmed and received my First Holy communion. Noreen was my sponsor (or Godmother as I like to call her) and it seemed perfectly natural to take St Faustina as my confirmation name, after all I had learned so much from her. I now feel like I am finally at home, right where I am suppose to be. I love the Church and the Catholic faith. I am so thankful that God called me to be here. I don't mean that in any disrespectful way to the Protestant faith. We all have our own ways to praise God. But for me it's all about the Mass, the tradition and the completeness of the faith - all that is seen and unseen. 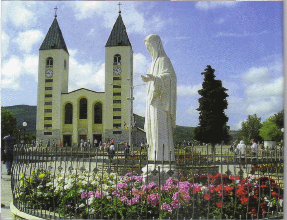 As I look back I know without a doubt that my conversion happened in my first visit to Medjugorje. Our Lady had definitely reached out to me there but it would take three years for me to make my journey. Age 33 years, I finally arrived. All thanks to faithful witnessing friends, patient spiritual direction, good pilgrimages, a desire to learn, an open heart, a very good husband and above all the Divine Mercy of God.